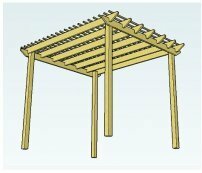 These attached pergola plans are intended for beginners, so that everyone has the opportunity to build something very special in their garden this year! 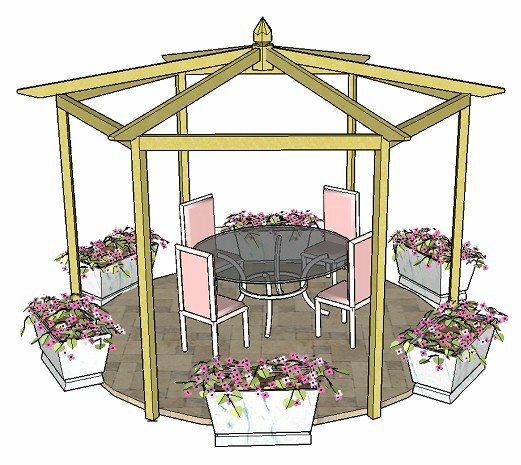 Quick and easy to build, even for those with very little experience, the step-by-step plans make creating a fabulous pergola a breeze! There's nothing more relaxing than spending a lovely sunny day under the rafters of an beautiful pergola, whiling away the hours with friends and family, and having a wonderful outdoor room in which to do it. 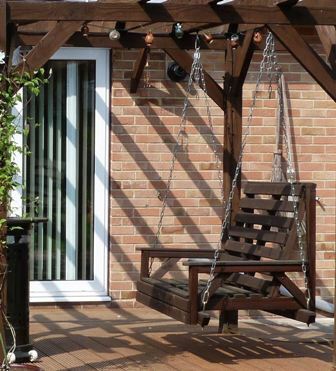 This type of pergola has become much more popular in the last few years; and understandably so. 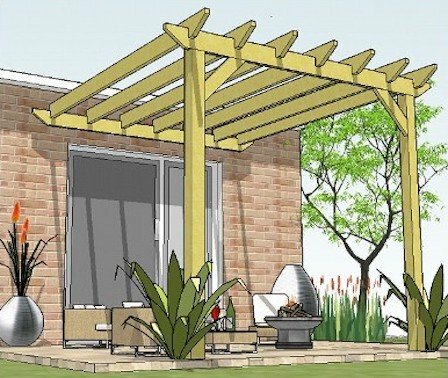 We all relish an oasis of peace and tranquility in our busy lives, and these attached pergola plans are an ideal guide for those wishing to enjoy an extension to the house at minimal cost. An added bonus is that you can surround yourself with stunning and fragrant climbing plants, vines, wonderful garden furniture and pots. You'll be spending a good deal of the year out here under the rafters, you'll see! Sometimes called lean-to or patio pergola designs, these plans are fully adaptable, so you can make them fit not only your space, but also the look and feel that you prefer. 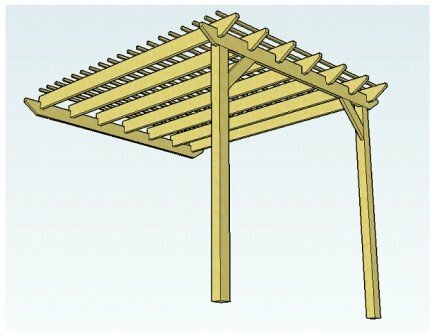 The attached pergola plans come with 18 free rafter tail templates to add a unique touch to your creation. The pergola building plans can be made to fit any length, depth and height, giving you absolute control over the way that you use the space. 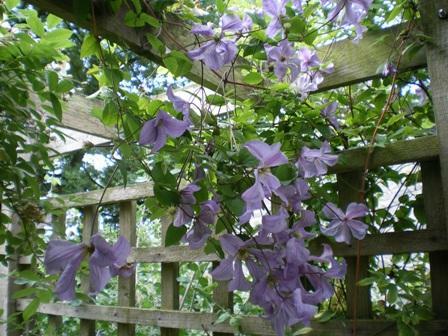 Wouldn't you love this heavenly purple clematis clambering through the rafters of your outdoor room? They're not difficult to grow, especially if you have a good structure over which they can clamber. And there are literally hundreds of different types and colours to choose from, as well as all the roses and vines available. 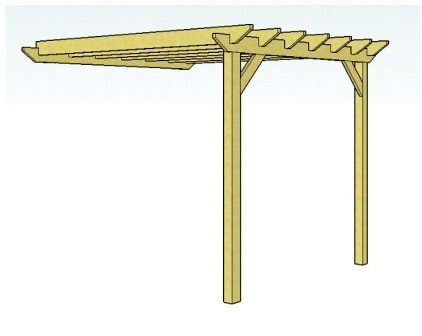 Use these attached pergola plans to create an extension to the house, or, if you prefer, make the pergola into a carport, a log store, an entrance way over a door, an entranceway along a wall, a utility area, a garden seating area attached to a garden wall, or a lovely flower-covered walkway. Jeff made one with a hanging seat. He added lights and a patio heater to make it a magical place to entertain in the evenings (and well into the night!). Ornaments have been attached to the pergola rafters giving the whole area a personal touch. This one can be bought as a kit, with chains and fixings included. Suspend from the rafters for instant comfort and pergola appeal! All wood can be painted or stained any colour, or left to age naturally. Here's a twin seat opposite, creating a very enclosed and cosy area. 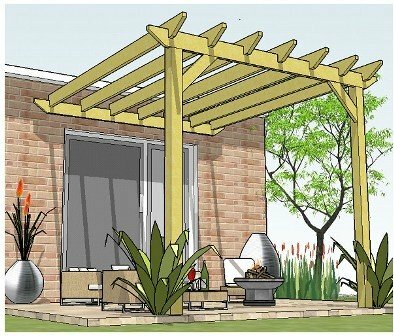 The attached pergola plans can be adapted for any size of area, whether the pergola is built onto an exising patio, deck, lawn or gravel base. 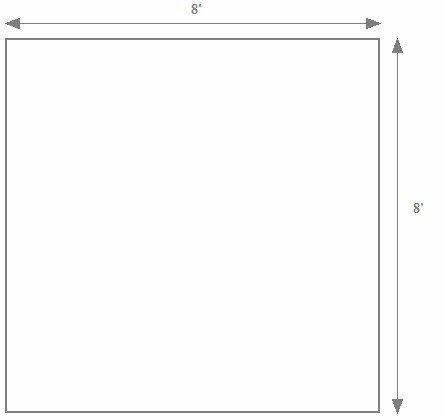 The plans are written using a footprint of 8' x 8'. They explain how to extend the pergola, putting in extra posts along the way. This is fully covered in the 'Adapting The Plans' section. 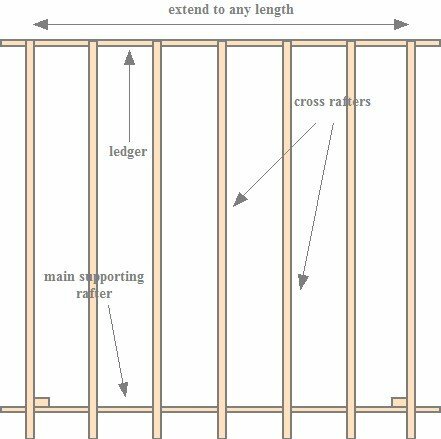 The pergola picture at the top of the page is drawn to scale, with a post size of 4", and rafters measuring 6" x 1.5", but again, the attached pergola plans will show you how to use different sizes of timber to suit your own particular preference. There are 18 different rafter tail templates to choose from to give your attached pergola a really unique look; one being the basic straight rafter tail template design, and then there are 17 curved ones, with classy lines! These are automatically downloaded with your attached pergola plans. This is the basic pergola design. It looks great just as it is! Even so, there are many ways to alter the appearance. The rafters, shown on the example, are raised to give a feeling of more depth against the main front and back rafters. These could easily be fully notched or completely unnotched, if you prefer. Here it is with purlins attached to the top of the rafters. 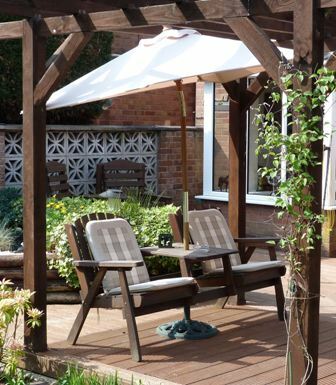 These can be used in order to provide added shade, or for the purely decorative effect they bring. 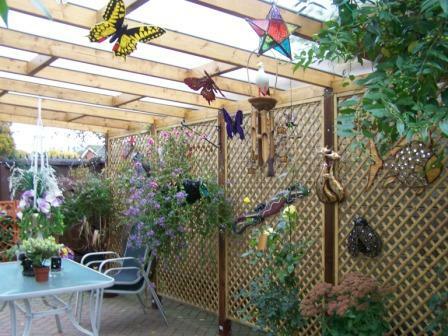 Find out other ways to make your pergola a fantasically unique and interesting space. All is explained within the attached pergola plans. Is This Pergola Easy to Build Myself? 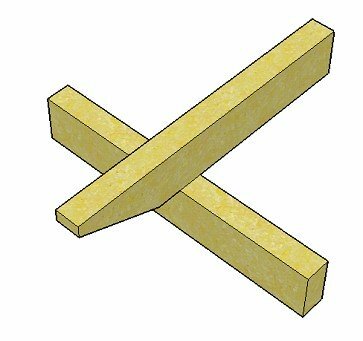 Even though the finished pergola looks stunning, it is actually quite straightforward to build once you know what size fixings to use and where to cut the notches. Just follow the plans and you will have this wonderful pergola installed in no time at all. And you will be able to build it for around about £160, with all the timber and fixings included. The beauty of building a diy pergola is that you can modify it so that it exactly suits you taste, style and situation at a fraction of the cost for someone else to come and build it for you. Buying a pergola kit is another option. You will pay more, have less control over the design details, and will have to install it yourself, anyway. 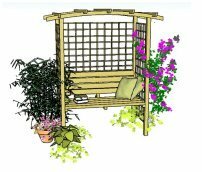 These particular plans were created for someone who wanted to build a specific pergola design for their garden, so they form part of the 'Additional Pergola Plans Series'. Of course, you can use the principles outlined in the free pergola plans to build any pergola or arbour. But if you would prefer to have a step-by-step guide to building this particular pergola - which is a little more 'involved' - for the price of one of the rafters, you will have at hand detailed instructions on how to create an absolutely beautiful structure for your home and garden. They include a section on adapting the plans, to fit your needs and particular situation. They will show you how to stop damp penetrating the adjoining wall, using an easy method. The finished pergola looks absolutely fantastic! Here's one that John built from the plans. He has extended the pergola to at least double the length. It looks absolutely fantastic! 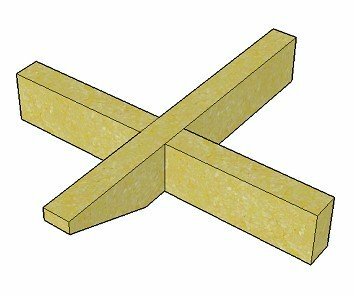 Making your pergola longer or deeper. Different ways to fix the ledger. Click on the 'Add To Cart' button below, follow the simple instructions and your lean-to pergola plans will be with you straight away. I hope you have as much fun building your attached pergola as I've had getting the plans ready. I'm sure you'll be very proud of your creation! Here's to your fantastic new pergola.